M2D2 is pleased to welcome KnipBio as the first resident company in their new biotech center located in the Freudenberg Building at 110 Canal Street in Lowell MA. KnipBio is working on a novel human health and aquaculture technology. The 11,000 square foot center is made up of a fully-equipped, shared lab facility that can house 50 researchers and also includes plenty of co-working and meeting spaces. Add in parking and its close (3-block, 7-minute walk) proximity to the MBTA commuter rail, and you have the perfect new home for Boston start-ups! Start-up companies and entrepreneurs utilizing M2D2’s new center will have access to all UMass Lowell and the UMass Medical School in Worcester have to offer. Engineering, prototyping, clinician review, animal trials, clinical trials, business mentoring, and partnerships with investors are all available at their fingertips. 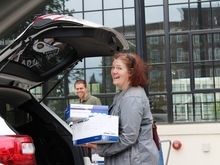 More information and tours are available by contacting M2D2@uml.edu; telephone (978)934-3465. 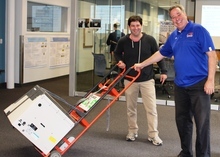 The KnipBio team moving in. They are all thumbs-up about their new home!